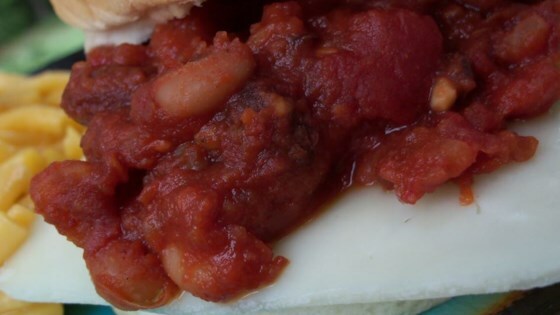 "If you love the idea of Sloppy Joes, but you are a vegetarian - fear not! Sloppy Sams are for you. These yummy sandwiches are so good that even a child will eat them without question." Combine water and lentils in a saucepan; season to taste with salt if desired. Bring to a boil over high heat, then reduce heat to medium-low, cover, and simmer until tender, about 30 minutes, stirring occasionally. Meanwhile, cook onions with the olive oil in a large skillet over medium heat until the onions have softened and turned translucent, about 4 minutes. Add tomatoes and garlic, and cook for 5 minutes. Stir in tomato paste, ketchup, mustard powder, chili powder, molasses and Worcestershire sauce; simmer 5 to10 minutes until thickened. Drain lentils and reserve cooking liquid. Stir lentils into sauce mixture, adding cooking liquid or water as needed to obtain the desired "sloppy joe" consistency. Serve on buns. These kid-pleasers are tasty--and really aren't all that sloppy! Tasted pretty much like baked beans on a bun to me. If that sounds good to you - go for it! My husband loved these, but I am not a huge fan of lentils. Good alternative if you don't want meat- thanks! Just to inform people that you can buy vegeterian worcestershire sauce that omits the anchovies. Very Good! Even my husband approved! I used brown sugar instead of molasses. Excellent meat free recipe!